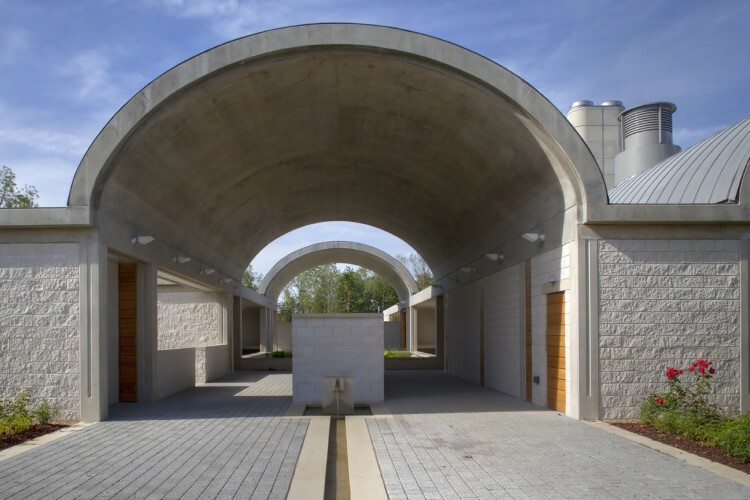 Our third crematorium project has been completed at Crownhill in Milton Keynes. 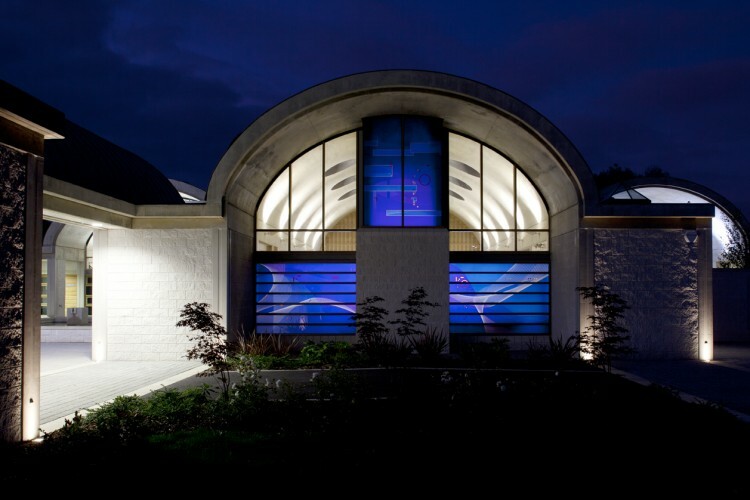 We were appointed by Milton Keynes Council to project manage the construction of this beautiful building which uses concrete, oak and terned stainless steel, with stained glass by Julian Stocks, extensive landscaping, woodland walks, water features and a calm atmosphere. 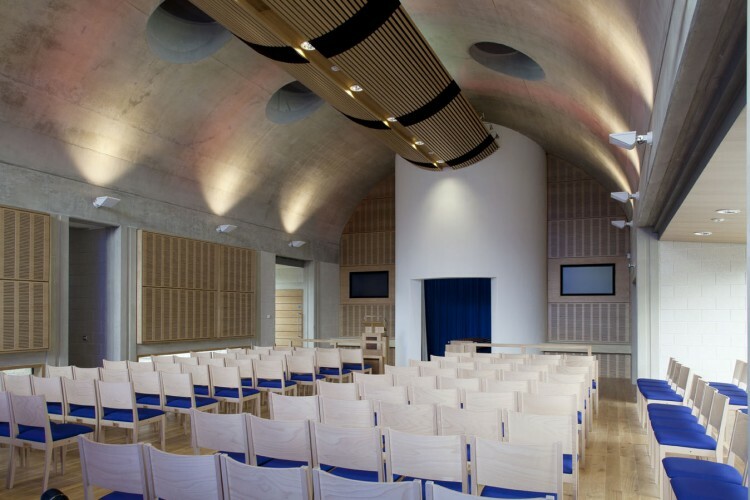 With its uplifting interior the chapel has also been used for blessings at weddings, and the fine acoustics of the chapel have resulted in the local orchestra using it for practice. The structure is in-situ exposed concrete. 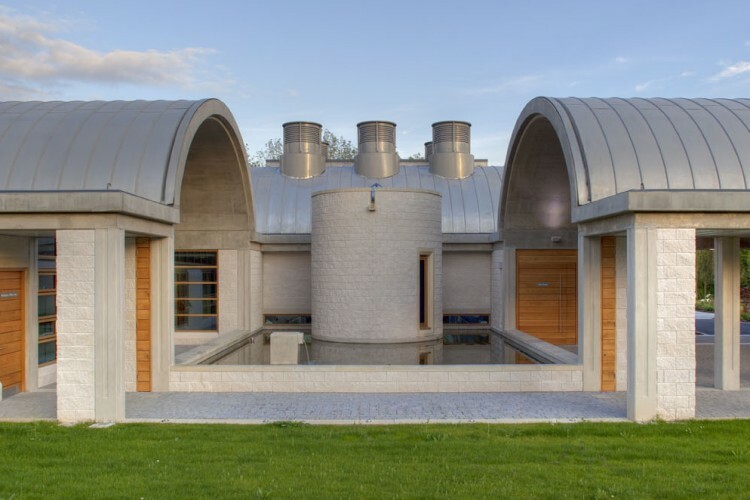 The columns are in Agilia self-compacting concrete which required the highest quality shuttering, with the finished surface having a very fine textured finish in a smooth paper-like effect. 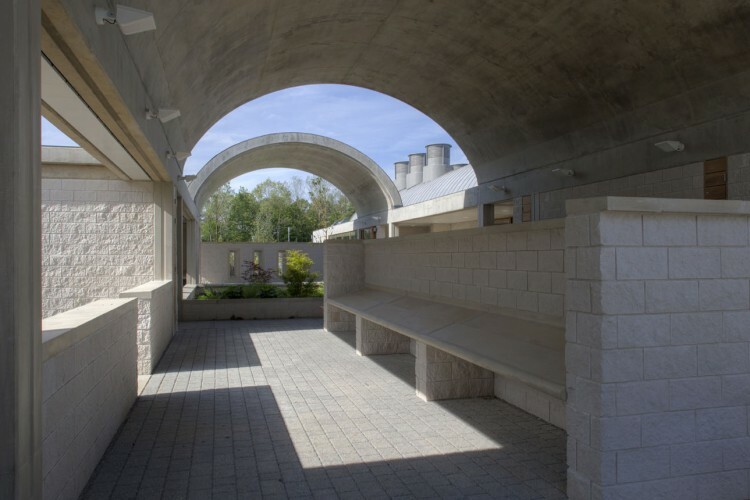 Soaring concrete vaults were formed with a reusable metal shutter and used a concrete mix which incorporated titanium dioxide to achieve a very white pigmentation. The sustainable strategy uses boreholes serving ground source heat pumps coupled with heat recovery from the cremation process. 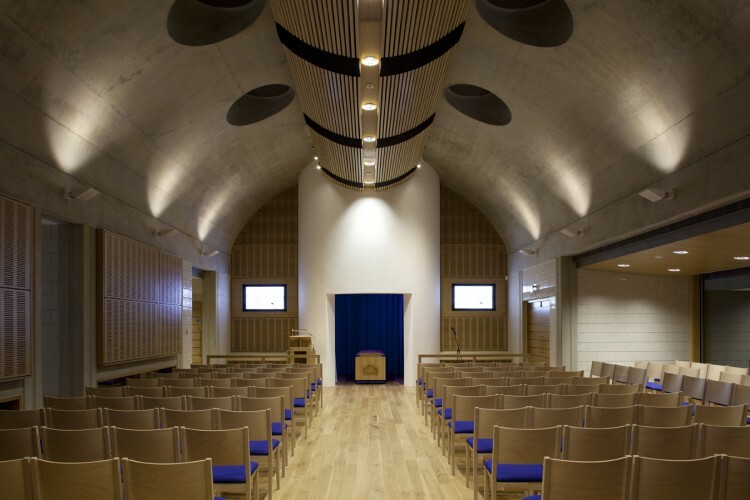 Planning of the building was carefully developed to maintain the privacy of groups of mourners, with a clear route from entrance to waiting room, chapel, flower court and garden of remembrance. 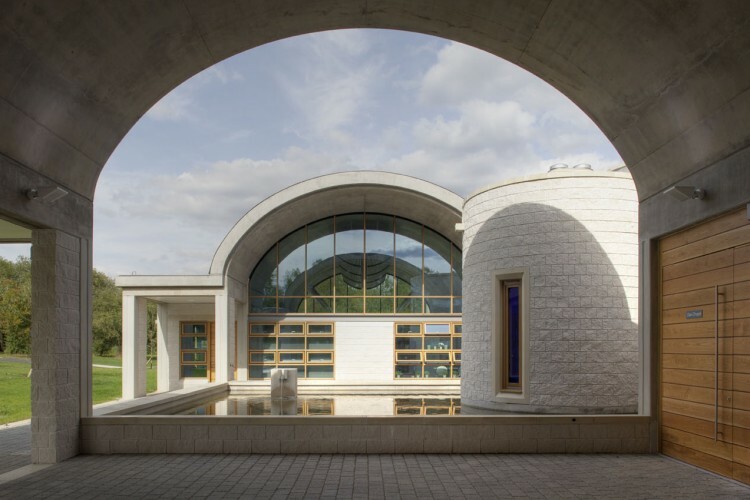 The calming design uses height, daylight, water and views to allow visitors time for contemplation. Landscaping was an essential element and combines loop paths with visually-attractive SUDS ponds, rills, bridges, lawns and woodland. The work had to ensure protection and preservation of great crested newts. 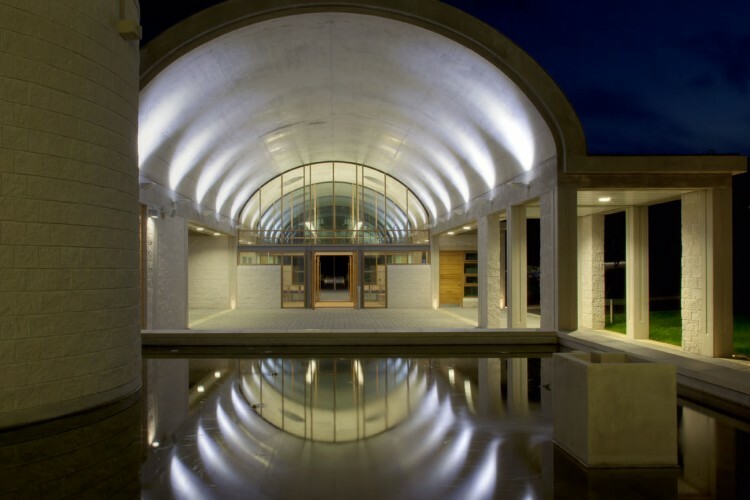 The completed project won a Certificate of Excellence in the Concrete Society Awards.